and the 1966 - 1967 European Trials Championship. 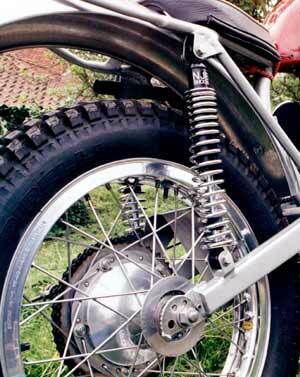 The Anglians were initially produced in 1966 with the famous 'Banana Leading Link' front fork. 1967 - 1968 saw the first machines produced with Ceriani telescopic forks, then with MP forks which we have reproduced today. The Anglian was regarded as the best lightweight trial machine of its day. Many works riders and privateers gained premier awards in trials such as the Scottish Six Days and the European Trials Championships. Todays machines look identical to the 1968 models but the engineering and reliability have come a long way in 30 years. Powder coated Reynolds tubing, swinging arm bushes from Metalastick, maintenance free electronic ignition system and full circle Alpha cranks make up just part of the Anglian. Even the conical hubs have been reproduced for authenticity and weight reduction. Each machine is carefully hand built and every care has been taken to give you a product you can be proud to ride. Castings are machined on the lastest CNC equipment. Dunlop 801 sticky tyres on aluminium rims give the bike grip even on slippery rocks. The Anglian is built to last with spares available off the shelf. The machines can be ridden in the Sammy Miller Classics Trials Series and events affiliated to the ACU and AMCA Trials schedule - so you have plenty of competition, if you want it or just a nice ride out to blow away the cobwebs. Either way we are sure you will enjoy the Anglian for years to come. Our brand new Deluxe Anglian costs �6500.00 inc VAT, however if this price is outside your budget we can produce a standard machine for around �5700 inc vat. The "budget" Anglian would be similar to the bike shown on page 130 in the Greeves book but still be built to the SAME QUALITY as our deluxe version. The machine will have the traditional RED fibre glass tank and black seat with white piping and of course have the ALUMINIUM beam down tube.